The magnificent Pantages Playhouse Theatre is among the best of the vaudeville houses built in Canada between 1913 and 1920 and the first large concrete theatre in North America. Designed by B. Marcus Priteca of Seattle, Washington, for a flamboyant entrepreneur, Alexander Pantages, the structure reflects the period prestige of its chain, once the largest independently owned circuit of motion picture and vaudeville houses in the United States, and of Winnipeg, an enterprising western metropolis burgeoning with wealth. Outside and within, the theatre is a skilful display of the signature ‘Greek Pantages’ style of Classical Revival architecture. Especially noteworthy is the lush interior with its rich finishes and details and good sightlines, acoustics and circulation patterns. 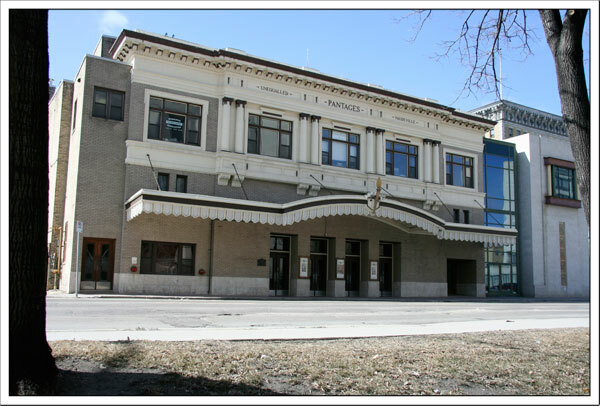 Little of the main facade, lobby and auditorium has been altered and, with the contemporary expansion of various functional spaces, the theatre continues to be a vital live performance venue situated within a cluster of major entertainment facilities in the Exchange District National Historic Site of Canada.